Neighbour to the already certified, zero carbon (code 6) Larch House, both houses were designed to meet the demanding performance criteria of the passivhaus standard in this exposed and misty, hilltop location in south Wales. The Lime House is cheaper to build than the Larch House because it has smaller windows that do not need blinds for summer shading, reducing the cost of the windows and eliminating the cost of the blinds. It is named after its lime rendered walls and follows the unfussy form of a traditional Welsh cottage. Its simple, compact shape minimises the surface area from which it can lose heat, as well as the amount of insulation it needs. 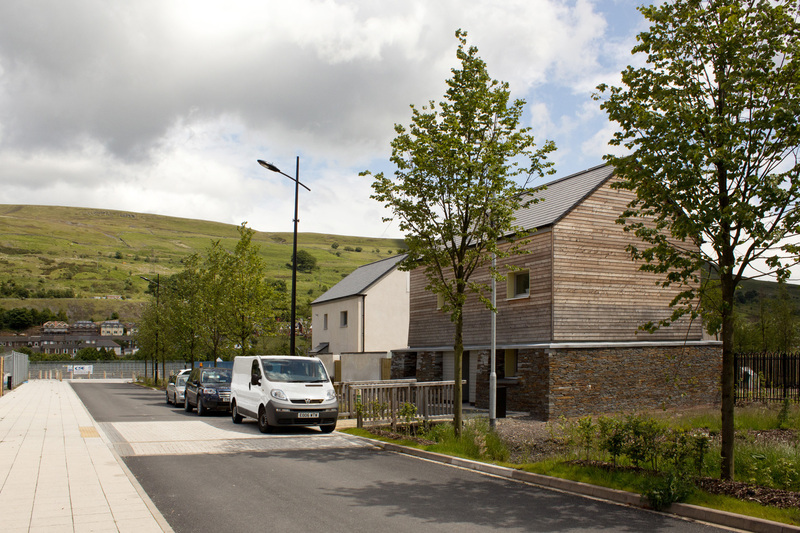 The Lime House uses locally sourced and manufactured goods and materials wherever possible: Welsh skills, suppliers and products have contributed to one of the most energy efficient houses in the UK. In the Lime House, we were able to install the first UK-produced, triple-glazed, certified Passivhaus windows, which we developed with Wood Knowledge Wales and Bill Robertson, using Welsh wood for the insulated window frames. All of the windows and the front door use Welsh larch timber, thermally modified in Anglesey; most of the timber for the doors, wall panels, floor slabs and roof elements is from Welsh forests; most of the insulation is made in Wales, and the roof tiles come from a factory only two miles away. The staircase, the stonework and even the solar panels have all been made in Wales. The closed-panel timber frame system was developed in close collaboration with Holbrook Timber Frame using Welsh timber, adapting framing techniques from German Passivhaus dwellings for use with faster-growing, softer Welsh timber. The panels are filled with Welsh-produced insulation in the factory, then clad on site with two further coats of insulation: a thick layer of natural loose-fill wood fibre on the inside, and the same depth of rigid wood fibre board on the outside, rendered with a thin coat lime render. The in-use performance of the house was monitored with funding from the Technology Strategy Board (TSB) with tenants moving in after the initial research phase. "the gas bill was £6 and the electricity was £14"